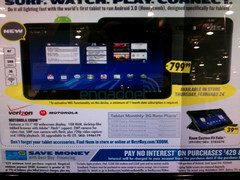 After many leaked dates and prices we finally have official confirmation from Best Buy as to when the Motorola Xoom will officially launch and for how much. After airing their much hyped Super Bowl ad yesterday, Motorola has now launched a portal for their tablet and Best Buy has released a flyer detailing all the important info. Accordingly, the Xoom will be launched on February 24th (confirming an earlier FB post by Best Buy Grand Rapids) and will sell for $800. The Motorola Xoom will feature an NVIDIA Tegra 2 (1GHz) processor, 1GB RAM, a 5MP HD camera and will be the first tablet to run Android’s newest Honeycomb OS. The tablet will also feature a 10.1” display with an HD resolution of 1200x800 pixels and will be 3G equipped with the option to upgrade to 4G. While the Xoom does boast some excellent specs, its pricing comes in at the high end of the tablet market. The reported $800 is more expensive than the iPad’s most expensive flavor, and could be a sticking point for pocket sensitive consumers. The Xoom will also come with 3G plans ranging from 1GB for $20/month to 10GB for $80/month. Unfortunately, some of the fine print on the flyer is causing a bit of a stir. According to the ad: “To activate WiFi functionality on this device, a minimum of one month data subscription is required.”. This is quite disturbing as users would have to sign a contract with Verizon in order to use their own home’s Wi-Fi connection. What’s baffling is the 3G contract doesn’t even bring down the cost of the Motorola Xoom, and given the premium price, customers are hoping this is just an unfortunate typo.